When was the last you craved for a biscuit? Sorry, I should rephrase this question, when was the last time you craved for a Biscuit smurf first produced by Bully around 1974? When Biscuit Smurf was first released by Bully it was given the name of Kuchen Schlumpf which translated from German to English means Cake Smurf. I am not entirely sure when they started referring to it as Biscuit Smurf. Like a lot of early smurfs produced by Bully, Biscuit smurf is made out of very soft pvc material and were also sometimes produced with unpainted eyes or without any eyebrows. It is also possible to find them with no markings at all or just © Peyo marking on the arm. 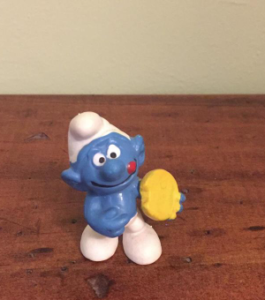 Biscuit smurf can be found wearing his customary white trousers and hat, holding a large yellow biscuit with a bite taken out of it in his left hand. The smurf can be seen licking his lips with his tongue. Bully produced Biscuit Smurf from 1974 to around 1977. 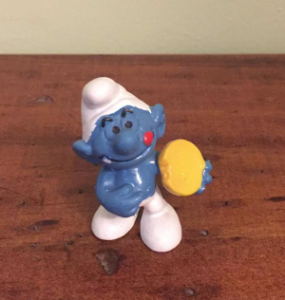 Schleich also produced Biscuit Smurf from 1980 to 1986 and was given article number 2.0080. Most of these Schleich ones were sold with Bully markings with the cavity number marked behind the biscuit. It is possible to find with Schleich markings but these are generally considered hard to find. Biscuit Smurf was never sold in Australia or United States. There is however an extremely rare version made with Hong Kong markings but I have only ever seen a picture of this one. So perhaps there were plans to release it in the U.S.A but it never happened. This may have something to do with the popularity of Cookie Monster from Sesame Street. 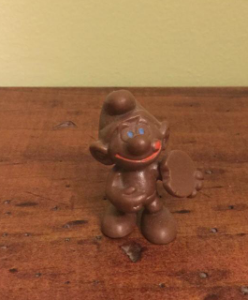 Biscuit Smurf can also be found in brown pvc material with only his pupils and mouth painted. Some collectors refer to these as Waldbaur smurfs. Waldbaur Smurfs were a special promotion that included a single coloured smurf with some details painted such as pupils, mouth, tear etc within a box of 20 chocolates, released around 1974/75. There is thought to be at least six different smurfs used as part of the Waldbaur promotion. However some collectors believe there are more…..
Biscuit Smurf is a simple designed smurf with lots of character and well worth craving!